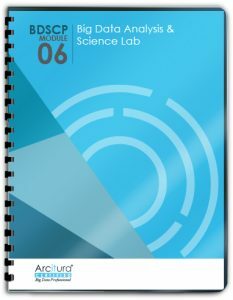 The Big Data Science Certified Professional (BDSCP) curriculum from Arcitura is comprised of 15 individual course modules. Course delivery options can include private on-site workshops, live virtual training, public workshops or self-paced training via Study Kits or eLearning. Each module is a one-day course when taught by a Certified Trainer or can take 10-14 hours to complete via self-study. Foundational course that establishes a basic understanding of Big Data from business and technology perspectives, including common benefits, challenges and adoption issues. Explores contemporary analysis practices, technologies and tools for Big Data environments at a conceptual level, focusing on common analysis functions and features of Big Data solutions. A hands-on lab providing a series of real-world exercises for assessing and establishing Big Data environments, and for solving problems using Big Data analysis techniques and tools. Focuses on the hands-on usage of the Hadoop and MapReduce framework, HDFS, Hive, Pig, Sqoop, Flume and NoSQL databases. Builds upon Module 7 to delve into advanced engineering, testing and debugging techniques, as well as the application of Big Data design patterns. A hands-on lab during which participants carry out a series of exercises based upon the tools and technologies covered in preceding course modules. Coverage of the Hadoop stack, data pipelines and other technology architecture layers, mechanisms and components, and associated design patterns. Drill-down of Big Data solution environments, additional advanced design patterns and coverage of cloud implementations and various enterprise integration considerations. A hands-on lab during in which a set of real-world exercises challenge participants to build and integrate Big Data solutions within IT enterprise and cloud-based environments. Introduces Big Data governance frameworks, and covers the basics of governing high-volume, multi-source data and Big Data technology environments. Steps through the Big Data lifecycle to cover specific precepts, processes and associated policies for regulating disparate bodies of data and Big Data solution environments. A hands-on lab during which participants are required to work with Big Data governance precepts, processes and policies to address a series of real-world governance concerns.